Strategic asset allocation across tax-sheltered and taxable accounts can help reduce taxes. Taxes are no fun. They may be an inevitable part of life, but savvy investment planning can reduce their impact. This type of planning requires holistic thinking about all your assets, considering asset allocation not only across asset classes and investment strategies but also across investment accounts. Tax-sheltered accounts, like RRSPs, TFSAs and company pension plans, are a good place to park less tax-efficient investments, like bond, dividend and actively managed funds. Taxable accounts should be reserved for more-tax-efficient strategies, including low-turnover equity index ETFs. This is a simple idea, but one that is often overlooked in practice. Too often investors fall into the trap of focusing on each individual account, trying to diversify locally, while losing sight of the bigger picture. It's OK if a taxable account is a bit equity-heavy if it's offset by a larger bond allocation in a tax-sheltered account and you can tolerate the added risk in the taxable account. It is important to balance risk tolerance against the tax advantages of using different accounts to hold different types of assets because the money in tax-sheltered accounts may not be as easily accessible as money in a taxable account. If you need the money in the taxable account sooner, make sure that it is invested in a manner consistent with your risk tolerance over that horizon. With that caveat, here's a closer look at why bonds, dividend strategies and most actively managed mutual funds tend to be better suited for tax-sheltered accounts. Most bond funds (both active and passive) are not very tax-efficient because they generate a large portion of their returns from regular interest (coupon) payments. These payments are taxed at ordinary rates, which for most are higher than the tax rates on capital gains and dividends, and investors cannot defer them. Even funds that target lower-coupon bonds can be tax-inefficient because they have to constantly replace holdings as they approach maturity, leading to high turnover and potential taxable capital gains distributions. Dividend funds' tax inefficiencies generally aren't as egregious as bond funds' because dividend distributions are usually taxed at lower rates than interest payments. Regular dividends are subject to a 17% gross-up and a federal tax credit of 10.52% of the grossed-up amount. A similar mechanism applies for taxation at the provincial level, though the rates vary from one province to another. Although most dividends are taxed at more favourable rates than interest income, dividend income funds tend to be less tax-efficient than their lower-yielding counterparts. This is because investors must pay taxes on dividends when they are received and don't have the option to defer them as they do with unrealized capital gains. There is value in deferring tax payments: Such deferrals allow money that would have been taxed to continue to grow, leading to higher after-tax returns when the investment is finally sold. So, it's more tax-efficient to generate returns from capital gains that can be deferred than from dividend payments that cannot. Of course, capital gains are no more tax-efficient than dividends if they are not deferred. Most actively managed mutual funds regularly distribute capital gains during bull markets, which hurts their tax efficiency. These capital gains distributions are triggered anytime a manager sells securities for a gain and does not have enough losses elsewhere to offset them, even when investors haven't sold any shares in the fund. Most managers don't think about the tax implications of their trades because they are being assessed on pre-tax performance. That said, there are some good tax-managed funds that focus on after-tax returns. While all mutual funds must distribute all of their capital gains each year, actively managed funds tend to be less tax-efficient than their index counterparts because they tend to have higher turnover. This leads to more sales in the portfolio and a greater chance of realizing capital gains. Like turnover, greater outflows can lead to higher capital gains distributions and larger tax bills, as they often require managers to sell some of their holdings to raise cash. Tax-sheltered accounts effectively allow investors to avoid the tax drag that plagues these investments. For example, RRSP accounts allow investors to deduct contributions from their taxable income and defer the tax liabilities from the contributions and investment returns until funds are withdrawn from the account, allowing investments to grow tax-free. Investment tax planning should not stop with tax-sheltered accounts. You can further reduce tax liabilities by placing more-tax-efficient investments in taxable accounts. These include equity index funds, particularly exchange-traded funds. Broad, market-cap-weighted equity index ETFs are generally tax-efficient because they have low turnover. ETFs build on this tax advantage by externalizing much of the trading to the secondary market and allowing the portfolio managers to move low-cost-basis shares out of the portfolio through a tax-free, in-kind redemption with their authorized participants (who are the only ones that can directly take money out of the fund). When authorized participants take money out of an ETF, they send their shares of the ETF to the fund company and receive shares in the fund's holdings in return. This is a non-taxable transaction, and it gives ETFs a big advantage over mutual funds, which often have to sell their securities to raise cash to meet redemptions. This in-kind redemption mechanism may not completely eliminate capital gains distributions, but it makes them less likely. What if you already have an actively managed fund (or other tax-inefficient holding) in your taxable account? Is it better to hold on to that fund and defer taxes on the unrealized gains, or sell it and replace it with a more tax-efficient and lower-cost ETF? The answer depends on several key variables: unrealized capital gains in the initial investment, investment period, tax rate, expected returns of the two investments, and expected capital gains distributions. Exhibit 1 summarizes the relationship between each of these variables and the relative after-tax value of replacing an old investment with a new one. While there are a lot of variables in play, a modest improvement in expected pre-tax returns over a long investment horizon can justify making the switch. The math is complicated, but to illustrate, I created some hypothetical examples. These examples assume a 50% unrealized capital gain on the original investment, a 20% tax rate, and that the original investment distributes 25% of its annual return (while the new investment makes no distributions). I tested these parameters under several expected return and investment horizon assumptions. 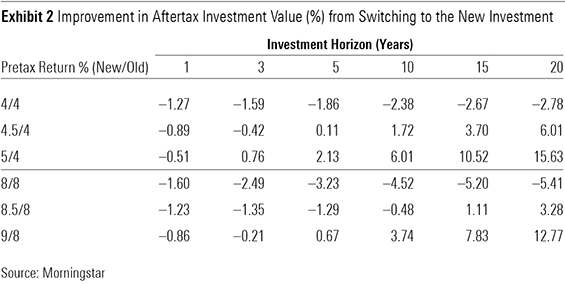 These scenarios compare the after-tax value of the new investment with the original investment. In calculating the after-tax value of the new investment, I assume that the investor sells the original investment, pays the taxes on the unrealized capital gains, places the after-tax proceeds in the new investment, and sells the new investment at the end of the investment horizon, paying all applicable taxes. The results are shown in Exhibit 2. This data demonstrates that if there is no difference in the pre-tax return of the two investments, it is better to continue to hold the original investment, despite its annual capital gains distributions. The higher after-tax value of the original investment comes from the value of deferring the unrealized capital gains taxes that an investor would incur in switching between the two investments. However, a small improvement in expected pre-tax returns over a long investment horizon can justify the switch. The magnitude of the return advantage required increases with the returns of the two investments. For example, when the original investment was priced to offer a 4% pre-tax return, the new investment would need to offer only a 50-basis-point return advantage across five years to come out ahead after taxes. But if the original investment were priced to offer an 8% pre-tax return, it would take an 83-basis-point pre-tax return advantage to break even after taxes. Cost savings from lower fees can often provide this type of pre-tax return improvement. So, if you can realize 1 percentage point worth of annual cost savings by switching from an actively managed mutual fund to an ETF, it could be worth doing so, even with the tax hit from recognizing the unrealized capital gain.